I am thrilled to announce that Back Beat Seattle has another show at the Comet! Be sure to come out on Saturday night to catch the Spinning Whips, Blood Red Dancers, Mongrel Blood and MOPPER in a lineup I am really proud to promote. Huge thanks goes to Sarah West and the Comet’s Mamma Casserole for arranging what promises to be an awesome evening. 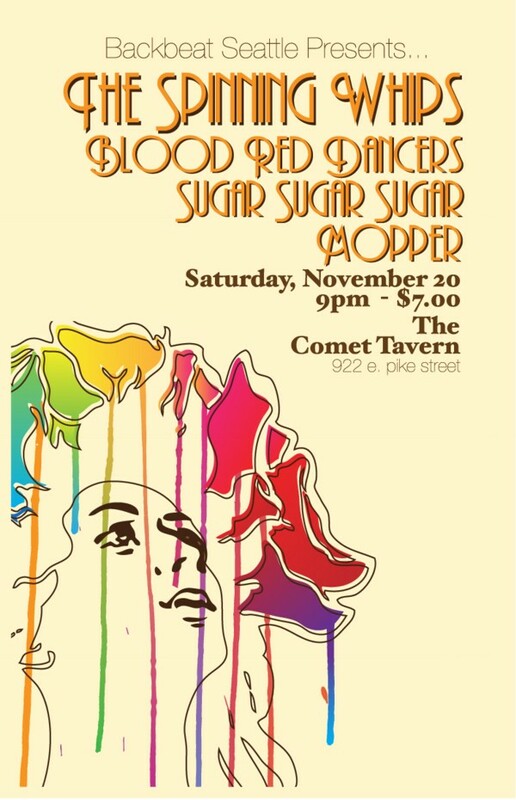 The Spinning Whips, who is working on their first release, and Blood Red Dancers are bands I love and have seen several times live, and I am really excited to see Mongrel Blood (in for Sugar Sugar Sugar, who had to cancel) and MOPPER (with the Valley’s Dan Beloit) for the first time. Mongrel Blood includes Spencer Moody from Triumph of Lethargy and Murder City Devils, Constant Lovers’ Eric Fisher and Cameron Elliott from Battle Hymns. Written by: Dagmar on 11/16/2010. This entry was tagged blood red dancers, mongrel blood, mopper, posted by dagmar, spinning whips. Bookmark the permalink.